Have you ever wanted to just close your eyes and be transported to the mountains? Where crisp, fresh air fills your lungs and the ridge tops stretch as far as the eye can see? 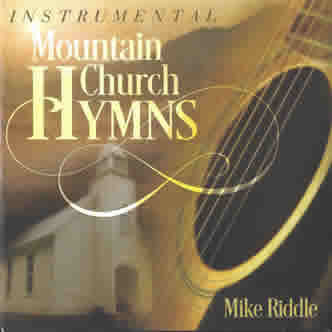 If that feeling has come over you, then I suggest you purchase a copy of Mike Riddle’s new instrumental CD, Mountain Church Hymns. This album newly released in 2017 features ten hymns played in a classic Appalachian style fans of Bluegrass and Folkmusic adore. As you listen to this project, you’ll hear a few instruments you might expect to make up a “mountain” band. These include dobro, fiddle, banjo played claw hammer style, rhythm guitar, viola, cello and autoharp played by David Johnson. Mike himself plays mandolin, the 12 string guitar and guitar using the old gut strings. Though the main focus of the project is Mike’s playing, you’ll hear these other instruments sweep in now and then on a verse or chorus. This gives the album the “band feel” that’s popular in the Bluegrass genre and pleasing to the ears. “Nothing But The Blood” is a great hymn to kick off the album with…especially Bluegrass style! From the first note you hear the fiddle and rhythm guitar harmonizing together to provide a toe-tapping accompaniment for the acoustic guitar. This first tune sets a standard of how the rest of the CD will sound; first you’ll hear Mike picking the acoustic, and then, other instruments will chip in on the melody to add an extra flare to the piece. On “Nothing But The Blood,” we hear a good amount of fiddle and dobro after the initial verse and chorus, then the melody will return to freestyle picking of the acoustic at the close. Usually, when I hear this hymn as a solo, it’s deathly slow. Maybe that’s because the lyrics lend themselves to a big ballad with a grand arrangement? No matter the reason, on Mountain Church Hymns, this familiar hymn is played with a steady beat that keeps the piece moving. The arrangement begins with the melody on the acoustic guitar. Once the first verse and chorus are finished, the dobro, fiddle and mandolin each play a verse and chorus with the rhythm guitar providing a steady beat in the background. Towards the end, you’ll hear some of these instruments come together and harmonize, but for the most part, each one is featured on its own verse/chorus. This arrangement is such fun! The twang of the dobro kicks off the intro and is echoed by the fiddle; and this leads into an upbeat finger-picking of the old song. I love the combinations on the arrangement – it’s never just the guitar, fiddle or dobro playing. Each instrument is heard throughout the piece with a certain lick or turnaround that adds their distinctive sound to the song. The style is fun, upbeat and will have your toes tapping in no time! The fiddle and mandolin set the tone for this upbeat solo in the intro. As I listen to the acoustic guitar play the first verse and chorus, I can’t help but think how much the style has Mike Riddle written all over it. Even when you hear Mike play with the Primitive Quartet, his picking has a certain sound that defines it as his…and that’s what I hear on this version of “At The Cross.” Let this one play for anyone who listens to Gospel Music and ask them, “Who played the guitar on that?” They’ll answer, “Mike Riddle.” The arrangement also has a good amount of mandolin and dobro in it, and the fiddle provides the intro, a verse and turnarounds throughout the piece. “In The Sweet Bye and Bye” is one of my favorite hymns and I love hearing it played Appalachian style. This piece begins with the acoustic guitar plucking out the melody while the mandolin is strumming a chord in the background. The second verse is played by the fiddle and then the arrangement starts combining instruments, making the piece more complex. The first combination you hear is the twang of the dobro on a line and the strings adding in a little extra. Next, you’ll hear the mandolin play a verse and chorus with the acoustic plucking a background pattern; this has an exceptionally pretty sound while the mandolin tremolos. This is one of those hymns that have been recorded so many times, it’s hard to know what to say about it. How do you describe the depth of what you hear when this song is so familiar it’s easy to take for granted? To begin with, I will say that there is depth to the music. To some, it can be hard to imagine that without a big orchestra, but to those who follow Bluegrass… you know exactly what I’m talking about. You hear it in the way the instruments are played – when it comes to that place where the melody isn’t just played by the dobro, it’s communicating the heart of the one playing. It’s felt. That’s what this arrangement is like – easy listening with a lot of heart behind it. In Gospel Music, “Goodbye, World, Goodbye” is known for being a high energy piano solo. To hear the same concept delivered on the acoustic guitar is a welcome change and is played masterfully here. Of course, some of the other instruments are thrown in on the second round to keep the “mountain sound” in the music. Be sure to listen at time marker :30-:45 to hear some complex technique. Though I’ve heard this Gospel song performed numerous times on the piano, this version is quickly becoming one of my favorites. The intro begins with a brief, yet sweet harmony played on the strings. This leads into the first verse, which is picked by Mike on the acoustic. After the chorus, the strings play a turnaround and then the dobro takes the lead on the second verse. When the second chorus comes around, the strings take on the melody until the chorus repeats once more, ending the arrangement with the acoustic guitar. I was glad to see this hymn appear on a CD like this. It’s always been a favorite of mine but doesn’t seem to make the cut often for hymn projects, yet alone, instrumental albums. This arrangement is easy listening with a smooth, mid-tempo pace. This arrangement of “Gloryland Way” reminds me “I Am A Pilgrim.” From the start, this upbeat tune takes off with all the instruments on board. As far as standout lines, you’ll hear the mandolin and fiddle in addition to the acoustic guitar. Be sure to listen carefully when the time marker reads 2:00-15 to hear the autoharp make its debut on a few lines.